Isn’t it fascinating to stop time for forever? Making all the memories stand still for the years to come. Forman Photography Society brings you Fcc Photography Competition, where you can share your time stopping memories with us. 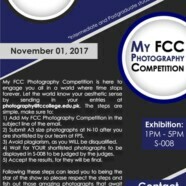 The steps are simple, email your entries at Photography@fccollege.edu.pk. 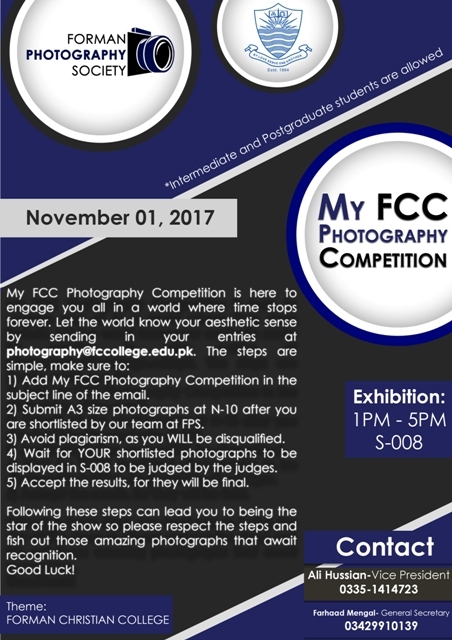 The subject line has to have ‘My Fcc Photography Competition’ whilst keeping in mind to avoid plagiarism to avoid disqualification. Shortlisted candidates will have to submit A3 size photographs in Room # 10, Ahmad Saeed Administration Building and will get their pictures displayed in S-008 for the judges to be examined. The results will be final with no further looking into them. So do your best. The last date to submit your pictures is Sunday 15 October 2017.